Students from Kansas City area high schools took part in the 38th year of the UMKC School of Medicine Summer Scholars Program in July. Sade-joy Dugbo had an idea that a career in health care might be part of her future. After spending the last week of July in the UMKC School of Medicine’s Advance Summer Scholars program, she’s convinced. As she prepared for her senior year at Kansas City’s Notre Dame de Sion High School, Dugbo joined a group of nearly 85 area high school juniors and seniors taking part in a one- or two-week experience in the health care profession. “Actually, seeing what it’s like to be a medical student, seeing first-hand what they do, what the doctors do, has really changed my view of what the medical field is like,” Dugbo said. Didactic classroom sessions are part of the two-week Summer Scholars experience. For 38 years, the Summer Scholars program has provided minority and disadvantaged students in the Kansas City metropolitan area the opportunity to find out first-hand what a career in health care looks like. The program also prepares them to be successful as they move from high school to college. Students take part in a two-week session of Summer Scholars each July during which they receive daily instruction in academic areas such as chemistry and language arts, and study anatomy and physiology in the school’s cadaver lab. Classroom experiences range from medical terminology and understanding health disparities to ACT and standardized test taking. Those who complete the two-week session can return the following summer to take part in the Advanced Summer Scholars, which provides additional experiences in different medical services such as emergency and outpatient medicine, rehabilitation, and nursing. This year’s advanced group was treated to additional hospital experiences including viewing surgeries in the operating room and shadowing students and physicians at Children’s Mercy Kansas City. The experience for advanced scholars was broken into two one-week sessions this year in order to allow more students to take part. Dugbo was part of the first session of Advanced Summer Scholars. “The ability to shadow the doctors and see the students in the hospitals was huge because I got to see how they interact with patients and what their daily lives were like,” she said. The hospital experiences opened the eyes of Emily Reed, a senior at Winnetonka High School who was also part of the Advanced Summer Scholars. Dugbo said that it’s still too early to say what field of medicine she’d like to enter or where she will go to school in the future, but her experiences these past two summers has made her sure of one thing. Her plan is to start looking into pre-medical school programs soon, and that includes applying to the UMKC School of Medicine. 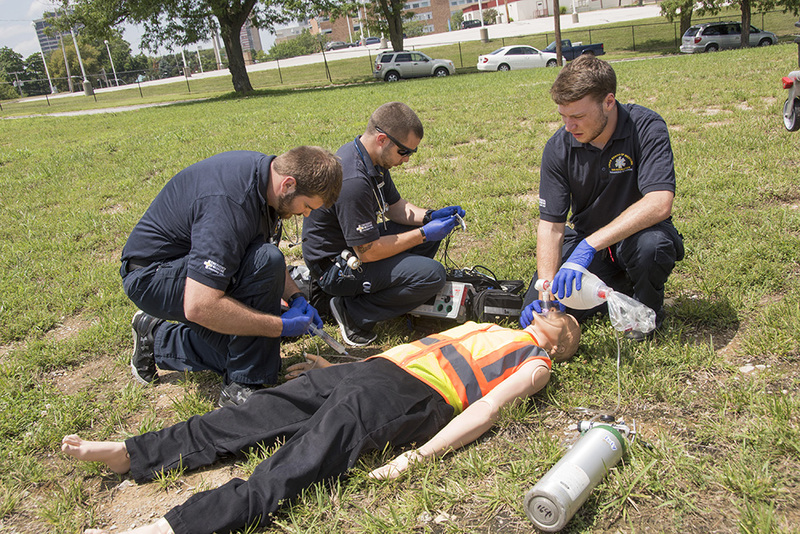 Field training is part of the curriculum for paramedic students in the UMKC School of Medicine Emergency Medical Services program. The UMKC School of Medicine Paramedic Program recently received a glowing report and full accreditation from the Commission on Accreditation of Allied Health Education Programs (CAAHEP) for its curriculum and training of future paramedics. The UMKC paramedics program is part of the Emergency Medical Services section of the School of Medicine’s Department of Emergency Medicine. Following a three-day site visit by a two-person team earlier this year, the program received a clean report with no citations. One examiner even referred to the UMKC program as meeting the gold standard for programs in paramedic training. “There are standards that have been prepared, basically the best practices for training programs across the country. This means our program has been favorably compared to the best programs nationally,” Ganss said. Paramedics are individuals highly trained to provide medical care including basic and advanced life support to people who suffer injuries or illness outside a hospital setting under protocols approved by a physician medical director. The UMKC program began training Emergency Medical Technician and Paramedic students in 2012 under the approval of the Missouri Department of Health and Senior Services Bureau of EMS. Its curriculum exceeds both the U.S. Department of Transportation and the Missouri Bureau of EMS. In 2013, UMKC received a Letter of Review from the Committee on Accreditation of Educational Programs for the Emergency Medical Services Professions as the program sought initial accreditation. The Letter of Review process allows graduates of the program to participate in the national certification examination for paramedics that is required for licensure in many states. UMKC currently has 11 students training in its paramedic program. A new class of trainees will join the program in January. Matthew Gratton, M.D., oversees the UMKC Emergency Medical Services as chair of the Department of Emergency Medicine. Jay Reich, M.D., FACEP, serves as chief of the EMS section and Erica Carney, M.D., serves as EMS education medical director. The School of Medicine recently completed the 36th year of its Summer Scholars program. 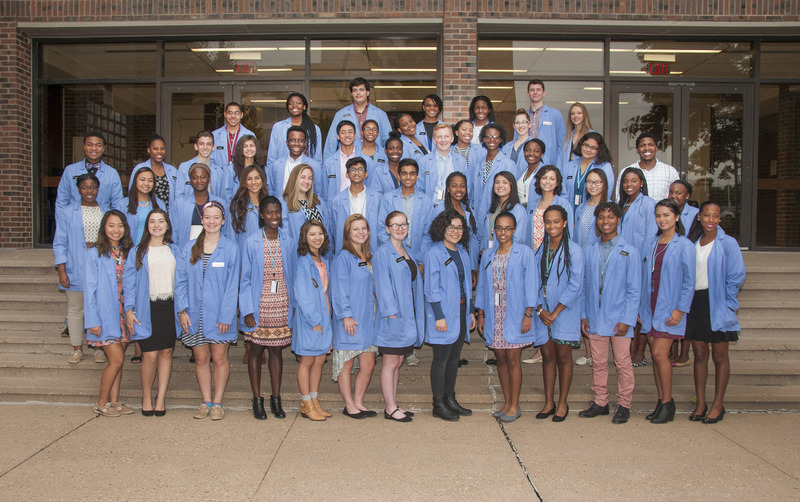 For one month each summer, minority and disadvantaged students from Kansas City area high schools immerse themselves in activities at the UMKC School of Medicine to improve their chances of success as a college student and jump-start a potential career in health care. The School of Medicine recognized the 2016 class of 49 Summer Scholars during its annual awards dinner and program at Pierson Auditorium. Participants in the program that takes place each July receive daily instruction in academic areas such as chemistry, and language arts and study anatomy and physiology in the school’s cadaver lab. Classroom experiences range from medical terminology and understanding health disparities to ACT and standardized test taking. Summer Scholars also experience different medical services such as emergency and outpatient medicine, rehabilitation and nursing services as well as surgery. Darius Jackson, coordinator of diversity programs and recruitment said this year’s program also utilized some of medical school’s student interest groups to lead some of the teaching sessions. For example, the Family Medicine Interest Group, the school’s surgical society and members of the Student National Medical Association led workshops in areas such as casting and suturing. Summer Scholars is for students entering their junior or senior year of high school. Those students who participate prior to their junior year and return for a second year of the program take part in the Advanced Summer Scholars. This year’s advanced program included a research component led by Michael Wacker, Ph.D., associate dean for student medical research, and fifth-year medical student Jazmine Smith. Those students studied their DNA, prepared reports and discussed their findings during presentations to their families and classmates at the awards dinner. This was the 36th year of the program with students from 48 different high schools participating. Many Summer Scholars continue their education in a healthcare field and school officials say that recently, nearly 5 percent of those who complete the Summer Scholars program have been selected for entrance to the UMKC School of Medicine. 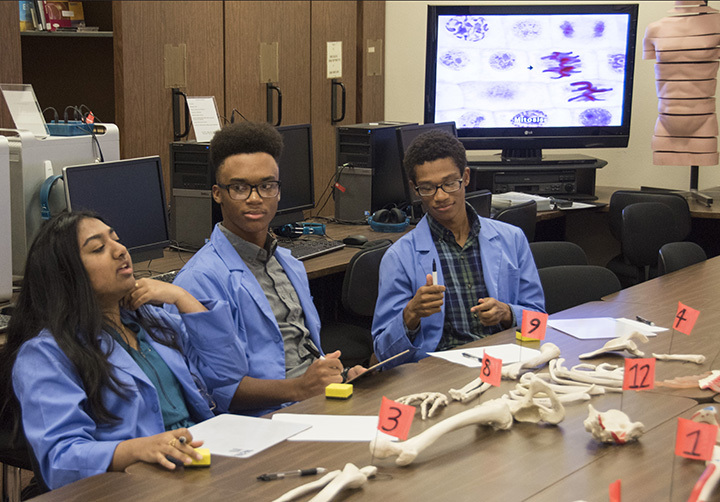 High school students in the UMKC School of Medicine Summer Scholars program participated in an experience in the UMKC cadaver lab. 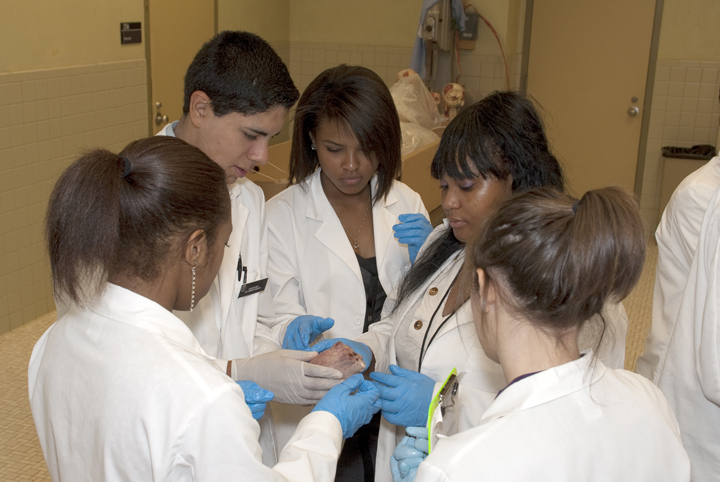 Minority and disadvantaged students Kansas City area high schools spent the past month immersed in activities at the UMKC School of Medicine in hopes getting a leg up on their future as a health care professional or simply improve their changes of success as a college student. The 31st class of Summer Scholars wrapped up a four-week session of lectures, classroom work, and clinical rotations Friday afternoon with a scholars forum at the UMKC Student Union. Each year, high school juniors and seniors selected to participate in the program receive educational and preparatory experience in areas of basic science, various aspects of the medical field, interviewing and personal development skills, and information about applying to medical school. Many graduates of the Summer Scholars program have gone on to attend and earn their medical degree from the UMKC School of Medicine. The 2011 class of 48 Summer Scholars included 11 high school seniors participating in the program for a second year as Advanced Summer Scholars. Participants receive daily instruction in academic areas including anatomy and physiology, chemistry, and language arts, as well as classroom experiences that range from medical terminology and understanding health disparities to ACT and standardized test taking. Summer Scholars experiences also include clinical rotations such as emergency, outpatient, rehabilitation and nursing services, surgery, and the cadaver lab.